By now, most health conscious and active individuals know and understand the need for increased protein intake in order to achieve certain results. For daily supplemental protein consumption, one can argue that a proper blend of multiple protein sources is ideal as different forms of protein assimilate at different rates in the body. 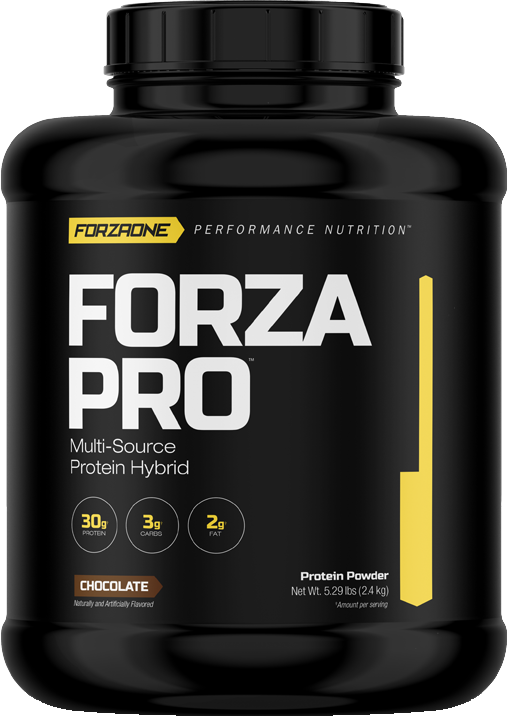 FORZA PRO™ is a protein powder consisting of Cross-Flow Microfiltered Whey Protein Concentrate, Cross-Flow Microfiltered Whey Protein Isolate, and Micellar Casein. FORZA PRO™ is designed for serious athletes and health-conscious individuals looking for a high quality, extremely soluble protein source. SUGGESTED USE: Mix 1 scoop in 6–12 oz. of cold water or your favorite beverage. ALLERGY INFORMATION: Contains milk, eggs and soy. Chocolate Peanut Butter and Peanut Butter Banana flavors contain peanuts. Manufactured in a facility that procesees milk, eggs, shellfish, tree nuts, peanuts, wheat and soy.